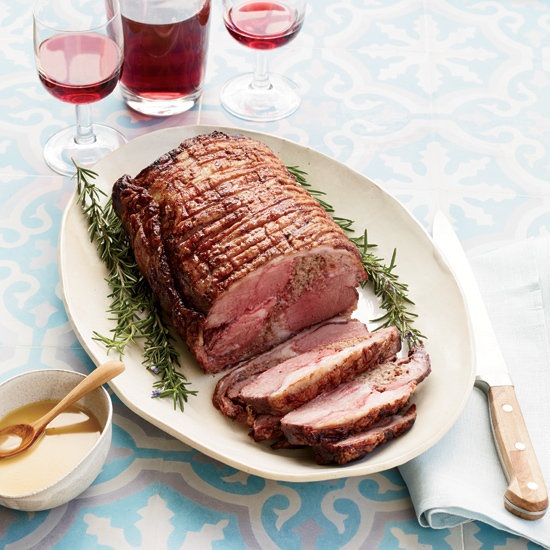 Here's what to eat on Easter Sunday—whether you prefer lamb, ham, salmon, or veal. 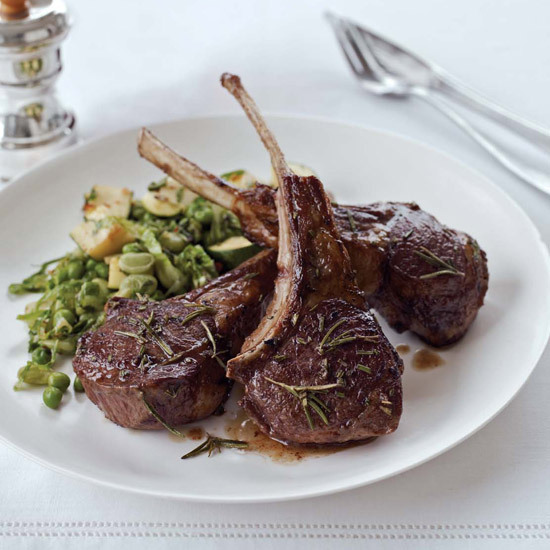 Here's what to eat this Sunday—whether you prefer lamb, ham, salmon, or veal. Whether you're hosting or pot-lucking Easter dinner this year, we've composed four menus for celebrating—depending on your protein preferences. There's one featuring April Bloomfield's lamb stew; another centered around a gorgeous glazed smoked ham; one featuring wild salmon; and one that stars veal and green stew from a French winery. Many of the recipes can be made ahead, and some are super simple—but all are delicious. 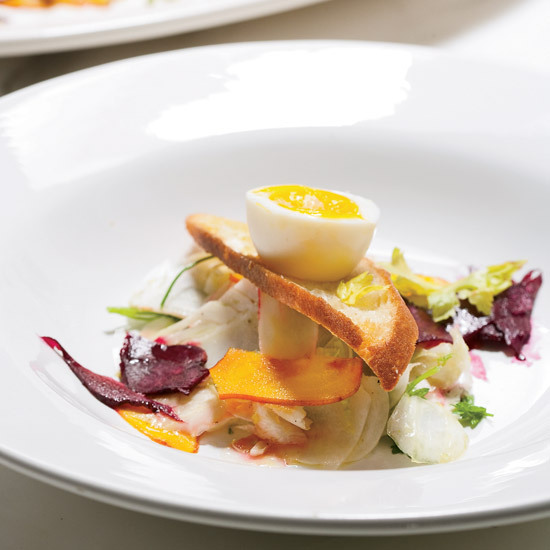 Even if celebrating Easter isn't on your calendar, you'll want to make these recipes, like Curtis Stone's grandmother's super crispy potatoes, Daniel Boulud's perfect crab starter and Jamie Oliver's trend-setting roasted carrot and avocado salad. Roasted carrots and avocado are salad standards now, but here's the lovely version from Jamie Oliver that pretty much established the pairing! Ham is the quintessential centerpiece of the Easter meal. 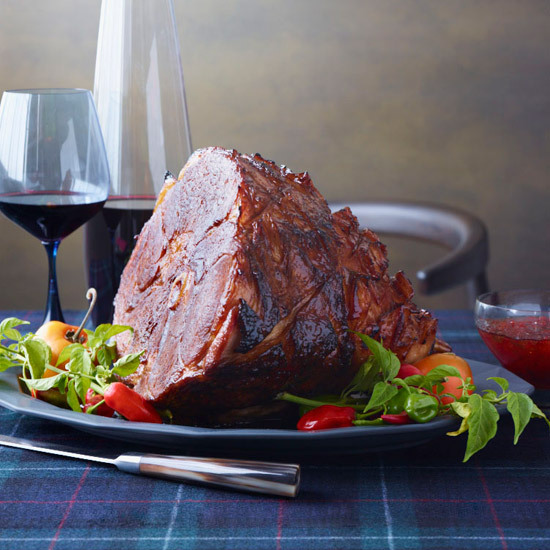 I think of it as the gift to the cook because it's so easy to prepare for a crowd and so hard to mess up, as long as you start with a nice ham in the first place. As another plus for the cook, ham goes with well with just about everything. Creamed spinach is such a luscious side, but it's the salted herbs that make this version really special. You'll have a lot of salted herbs leftover, but they're fantastic for adding a boost of flavor to soups, stews, eggs and basically any dish that needs a little flavor pick-me-up. These amazing potatoes from star chef Curtis Stone are almost like Tater Tots—super crispy on the outside and fluffy and creamy within. Pavlova is a festive dessert with an Australian pedigree. This version is perfect for spring, with the tangy rhubarb and strawberries as the perfect foil for rich mascarpone cream and crisp and chewy sweet meringue. 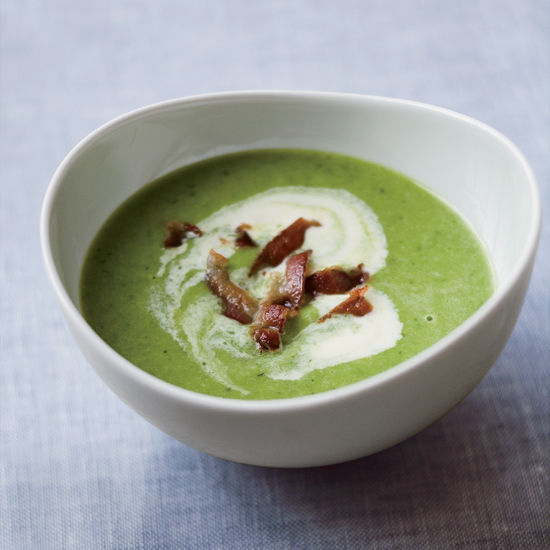 This simple, make-ahead spring soup is made with sweet baby peas and a luxurious light garlicky cream swirl. 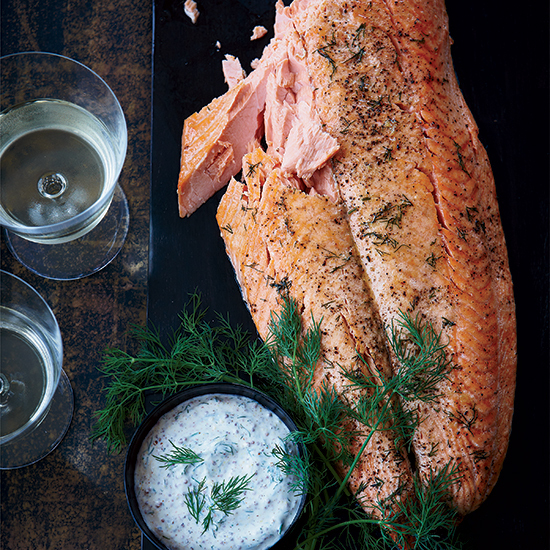 After a quick marinade, this no-work salmon just gets popped into the oven 30 minutes before you plan to serve it. These unusual oven-roasted new potatoes look like they were freshly dug thanks to a toss in tangy black olive puree. The creamy filling for this tart is cooked separately on the stove and then spread in the cooked shell. If you like, you could top the finished chilled tart with a double ring of fresh raspberries. In this easy-to-scale-up salad from star chef Daniel Boulud, peppery arugula and crisp juicy watermelon are perfect foils for the lightly curried lump crab. 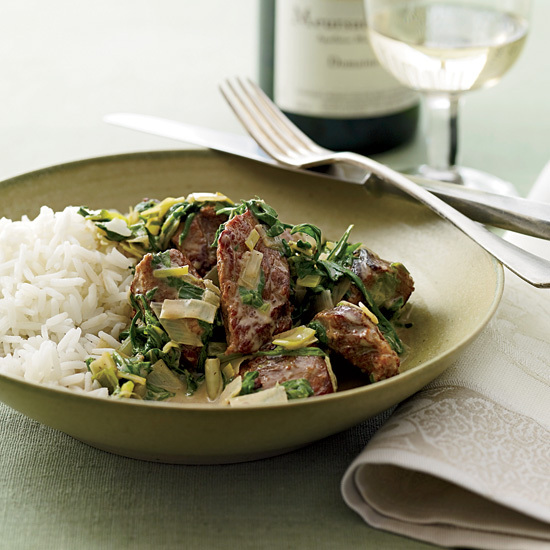 Almost 20 cups of greens and herbs, including spinach, watercress, sorrel, romaine and tarragon, go into the perfect-for-spring veal stew. Although the veal stew is lovely with rice—and would also be great with quinoa or farro if you prefer a whole grain—I like it best served with creamy potatoes, like these delicious Yukon Golds smothered in shallots. We love everything about this pie—the square shape, the buttery crust, and the intense strawberry flavor. Blanching the asparagus before grilling guarantees evenly cooked spears. Buy the nicest mozzarella you can find and let it come to room temperature so it melts slightly when it's put atop the hot grilled asparagus. 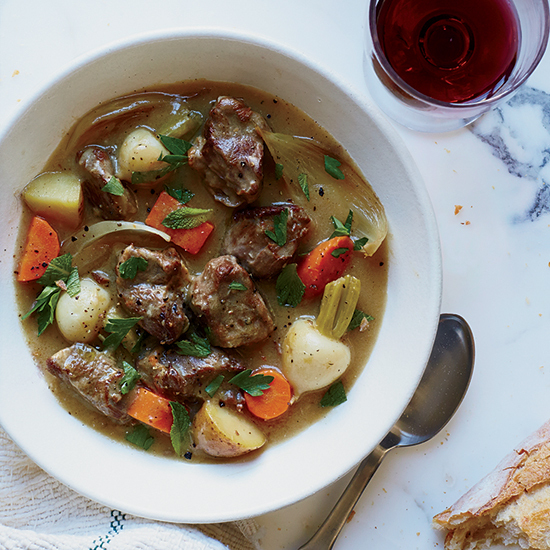 This lovely simple lamb stew from star chef April Bloomfield features sweet baby turnips with a bit of their greens still attached. This might seem like an unusual side dish, but the tomatoes are delicious with the lamb and the bread in the gratin acts like a crouton to soak up the delicious sauce of the stew. This easy flourless almond cake for a crowd comes together in minutes. To dress it up, you could serve it with ice cream or lemon curd.